Bring water to a boil in a medium heavy saucepan. Add rice, salt and milk; simmer gently, uncovered for 20 minutes until rice is tender. Meanwhile, heat oven 350 F degrees. Lightly butter a 1 1/2 quart shallow baking dish. Mix remaining ingredients. Stir in rice mixture. Pour into buttered baking dish. Bake about 30 minutes, until pudding is firm and knife inserted 1/2-inch deep into center of the baking dish comes out clean. Cool on wire rack. 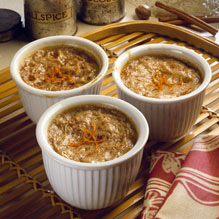 If desired, garnish with finely shredded orange peel and dust with ground cinnamon or nutmeg. Serve warm. For individual servings: Ladle uncooked into 6 small (1/2 cup capacity) buttered custard cups or soufflé dishes. Bake as directed above, reducing baking time to about 20 minutes.